The conference will be held in Fukutake Hall at The University of Tokyo Hongo Campus. 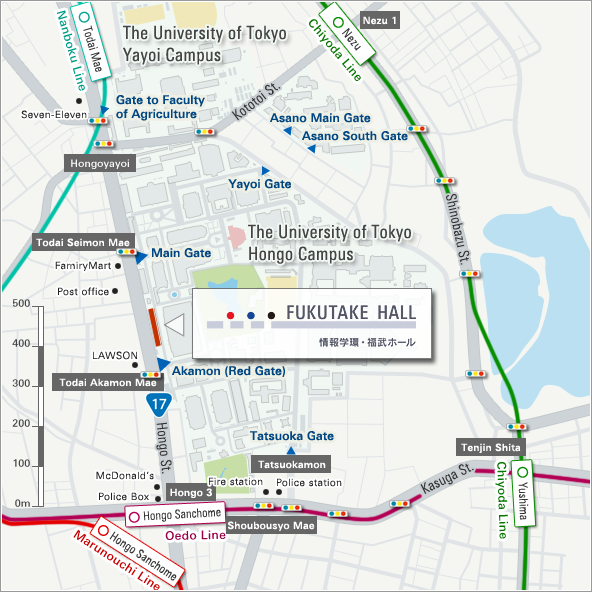 Long paper sessions, short paper sessions, poster sessions, pre-conference symposium, coffee breaks, JADH AGM will be at Fukutake Learning Theater (B2F) in Fukutake Hall. Workshops will be at Fukutake Learning Theater (B2F) and the main conference room of Historiographical Institute (B1F; 史料編纂所大会議室) in Fukutake Hall. Committee meetings will be at the main conference room of Historiographical Institute (B1F) in Fukutake Hall.